I am writing this response to my first negative feedback (out of over 100 total positive ratings from many satisfied repeat customers) because eBay limits my response on their site to only 80 characters - hardly enough room for the explanation which my potential customers deserve! This negative feedback came right out of the blue. The buyer never contacted me at all before posting it, never told me he was not satisfied, never gave me a chance to redress the situation. Though he must have received the item at least two weeks before posting the neg, since I mailed it out on 26 December, I heard absolutely nothing from him whatsoever until the neg suddenly appeared! Had I heard from him, I would have gladly done what I reasonably could to rectify it, yet I was never even given that chance. "The goldtone has partially come off of the two outer frames, revealing silvertone metal underneath." I believe I described the item's imperfections sufficiently. 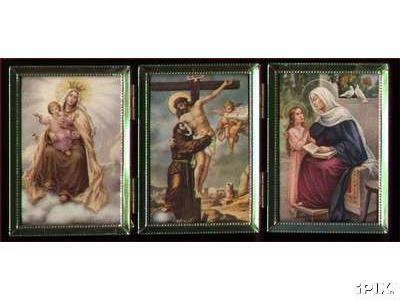 Though not in perfect condition, the frames and hinges were intact and the pictures were beautiful old holy cards. It is still perfectly usable, and I thought it was rather lovely, though perhaps not quite worth the $26 he bidded for it. When a buyer bids very high like that, it puts a seller in a real quandry. If you try to offer him a discount or free shipping, that is essentially unfair to the people who entered lower bids! No one forces a person to bid for an item; if he wants something then he may place a bid for whatever he is willing to pay, and if he has any questions about the item he can always ask. Also, one never knows why some people bid very high; is it because they have a compulsion - something akin to gambling addiction? Or is it because they are wealthy and willing to spend that much out of some sentimental attachment to the item? You really don't know, and you certainly don't want to potentially insult the buyer by asking! So the best a seller can do is sell it to the bidder at the price the bidder himself has set, and then hope that, if the bidder is unhappy with the item, he will give you the chance to make it up to him by a refund, replacement, etc.. Unfortunately, I was never given that chance. I hold no ill will whatsoever toward this person. I'm very sorry that the item did not meet his expectations, but I really wish he had informed me of his dissatisfaction, and given me a chance to make things right first. I received no such opportunity, and, in a way, I am even more disappointed about that! I hope I have clarified this very complicated issue. Thank you for your time and understanding.